There are more “sure-fire” functions in modern smart phones, so what now? They could universally support the blind and partially sighted, but there are still many users uncomfortable with smart phone touch screens. We are aware our users are capable of miracles, yet we understand this handling method can be an unprecedented obstacle for many. 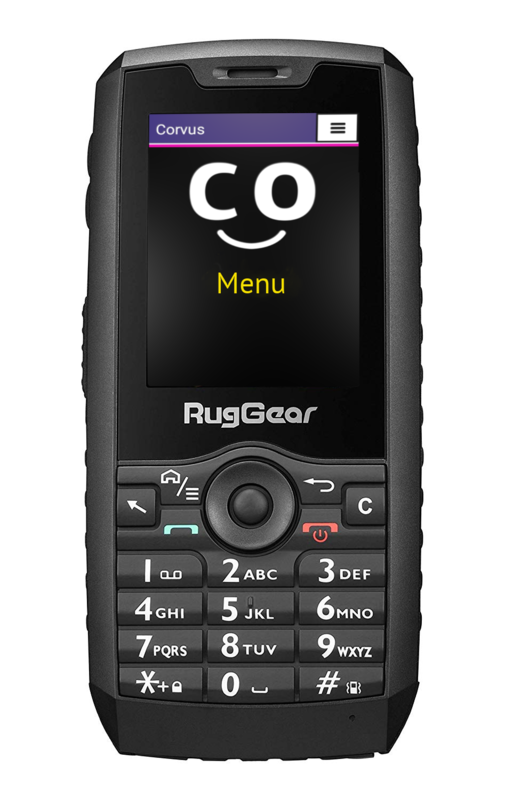 Let us introduce the simple but resistant Corvus RG160 smart phone which integrates the pros of modern smart phones combined with secure control by means of a standard, well-palpable keyboard, supplemented by the popular Corvus applications set. The Corvus RG160 smart phone is a very pleasant aid for making phone calls with its standard tangible keyboard - easily controlled, no need to apply touch gestures. Our best news is that it guarantees security, its IP68 enclosure withstands dust, water and falls from a height. And still, it is surprisingly light and fits your hand perfectly. Dial one digit directly on the main screen to contact you family/friends. Simple shortcuts open any favourite applications. Corvus RG160 also guarantees you safety and privacy. For example, your phone gives you your location if you get lost, which you may easily send to your family and friends. Optional screen shadowing will dissuade unwanted snoops. No one will ever stare over your shoulder at your phone screen. The Object search function supported by Corvus RG160 will definitely come in handy in your everyday activities. Place a small BeeNode tag (purchased extra) on an object of your choice, and the BeeNode can be “quickly rung” by your smart phone. The ring tone will guide you to a lost wallet or keys. Similarly, you’ll find your smart phone if rung from a magic BeeNode. You can label a bought compote can with a small sticker and teach Corvus what food is inside. Later on you can pick the can up from similar shapes, scan the sticker and immediately know what you are about to eat. J No need to buy the stickers. Print them easily at home using your home office printer. Corvus RG160 could not skip the most popular function - Book Download. There is not one but already five digital libraries for the blind to download directly to your smart phone - books and magazines in text or audio format. Downloaded documents can be instantly played in the elaborated media player. The resistant phone, IP68 rating, withstands dust, a fall from 1.5 m, is waterproof for 30 mins if sunk in 1.5 m deep water, and it remains light and fits your hand. A standard tangible 3x4 keyboard with additional keys which increase comfortable handling of the phone, and text can be also dictated. More than 30 applications integrated in the luxurious, simple-to-control, highly efficient and intuitive Corvus Interface. In other words, you do not need to learn to operate applications one by one, master one and you have mastered practically all. It is of course up to you which you will use. There are many practical functions such as notes, dictaphone, music player, calculator, calendar, task manager, etc. Digital libraries accessed by Corvus offer almost 200.000 books (especially in Czech and Slovak, some in English and German) for blind readers. It only takes logging in, searching and downloading and you are ready to listen. It cannot be simpler. It includes the most upgrade Corvus license (Corvus Effective) linked to their phone's IMEI; a phone with a pre-installed Corvus applications set can also be purchased without an activated license, if you already have one. We keep multiplying new Corvus functions, you cannot miss them as they are securely upgraded throughout your phone's service life. The Corvus phone allows you to install third party apps from Google Play, while the Corvus Reader makes their infinite option easily accessible. Who is Corvus RG160 designed for? Corvus RG160 is suitable for blind and partially sighted users who have thus far avoided smart phones because touch screens and complicated handling worry them. If you have experienced similar fears with smart phones, Corvus RG160 could open up an excellent way to the advantages that smart phones offer the blind and partially sighted. We believe you will be surprised how such a device improves your everyday life. There are of course many users who prefer powerful, “parameter-packed” phones with the most recent operating system, loads of sensors, a great camera, a huge memory, and especially those who do not avoid “touch screens”. We definitely advise them to consider buying the Corvus Effective PLUS applications set they could use on their dream phone. You can find more information about Corvus rg160 in detailed article on our blog. Corvus RG160 parameters support the applications below integrated in a unique, easily controlled user interface - the Corvus Interface (valid as of 01.03.2019). Each Corvus upgrade extends the Applications list.